I love gathering my eggs each day. I love washing them, drying them, and arranging them in cardboard cartons. It’s a time consuming chore that I could easily delegate to my children (and sometimes I do), but as often as I can, I do it myself. I savor the simplicity of the whole process, and I get a real sense of satisfaction from seeing all my eggs lined up neatly in their cartons. It’s silly, but one of the things that makes this chore such a joy is my egg basket. It makes me happy to carry it empty down to the barn and return with it full. It’s a charming little basket. For me, it adds to the joy of farming. Now that I’ve discovered Pinterest, I realize that charmingness and chicken farming go hand-in-hand. Apparently there is a whole subculture of poultry lovers out there, and their appreciation for all things chicken is delightful. 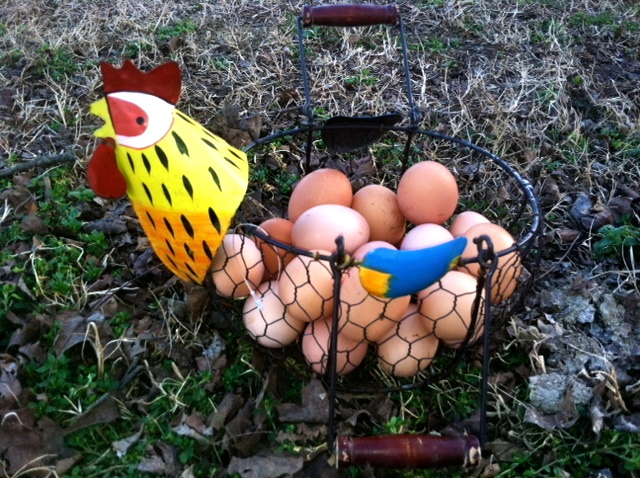 It’s fun to see what chickens and chicken accessories other farmers are using to add to the joy of farming. From darling muck boots to pretty aprons to lovely chicken coops, it’s all on Pinterest. If you’d like to see what I’ve found, Follow Me!